In all my reading of picture books, it seems like one of the most challenging genres to fill is the picture book biography. 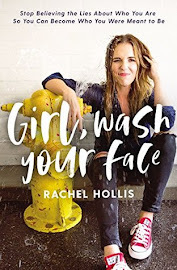 There is a vast difference between biographies a fifth-grader might use for a research project and biographies a three-year-old will want to sit through. But I don't want my three-year-old to have to wait until he's eleven to learn about the lives of amazing people. So I am always on the search for great biographies with captivating illustrations and engaging text--biographies that will be the gateway to helping my children (and me) learn about incredible men and women. Don't let the cover persuade you not to read this book. I almost talked myself out of picking it up at the library because I didn't like the cover, but I would have missed out on a truly inspiring story. When Ella Kate Ewing was seven years old, she hit a growth spurt. And she kept growing and growing and growing. When she was thirteen, she was almost six feet tall. And when she reached her final height, she was 8' 4", with a shoe size of 24. 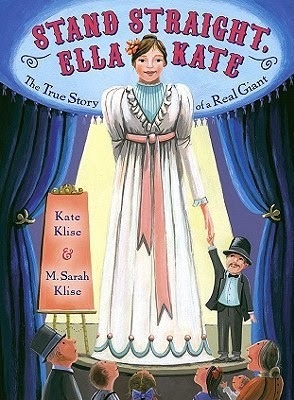 Ella Kate had a gland disorder, known as gigantism. At the time (late 19th-century), doctors didn't really know how to treat such a condition. Ella's growing up years were marked by unkind and cruel comments. But her parents always told her, "Stand straight, Ella Kate." Although shy and reserved by nature, by the time Ella was an adult, she decided to embrace her unusual height. She made money by standing in a Chicago museum where people would pay money to stare at her. Eventually, she traveled all over the country and the world as a circus show star. She was able to build herself a house that was just her size and loved seeing the wonders of the world. I don't know what it would be like if Ella Kate were growing up in today's world. Certainly we are more tolerant and respectful of differences. But at the same time, I think we try to look past and normalize those differences. Instead of embracing our uniqueness, we try to pretend that we're all the same. I think it's wonderful to be kind and accepting, but I hope it's not at the price of hiding what makes us different and special. The story is told in first-person, which I loved. It doesn't gloss over the fact that living a life when you are 2-3 feet taller than all the other adults around you is hard. Very hard. You feel cramped everywhere you go; people call you a freak; nothing fits you the way it was designed. But it's also very hopeful: you can do anything you want and become who you want to be no matter the setbacks or discouragements you might face. This is honestly one of the most fascinating and inspiring picture books I've ever read. To condense one person's life into picture book format would be difficult enough. But to try to condense one person's ideas into something simple and understandable would be even more daunting. Especially if the ideas you're referring to happen to be Albert Einstein's. And that is why I love this book: atoms, E = mc2, and the theory of relativity--they're all there, but they're mentioned in such a matter of fact, ordinary way, you'd never guess (or rather, your three-year-old would never guess) there was any reason not to believe that everything is made up of atoms or that time would be altered if he approached the speed of light. At the same time, I never felt like the author downplayed the significance of Einstein's discoveries. For all her candid simplicity, she also gives his work the praise it deserves. I also just love the structure of the book: it follows the timeline of Albert Einstein's life: childhood, young adulthood, and mature years; there are random, interesting tidbits (such as that Einstein liked to wander around licking an ice-cream cone while deep in thought or that he liked to wear shoes without any socks); it touches on his frustrations, as well as his successes; and it gives the spotlight to his daydreams that resulted in some of the most important milestones in the history of science. And it does all of this without ever becoming wordy or tiresome. Will you know everything there is to know about atoms when you're done? No. But will you have a firm impression of Albert Einstein's life and character? Yes. The illustrations are a brilliant complement to the text. They are also simple with a careless, almost sloppy, feel about them. One of my favorite pages depicts Albert Einstein in bed with his feet poking through the rungs of his foot board while above him sketches of a planet, clock, bus, and bike swirl in murky darkness. But perhaps the best part of the book is the take home message: "[Albert Einstein] asked questions never asked before. Found answers never found before. And dreamed up ideas never dreamt before . . . But still, Albert left us many big questions . . . Questions that someday you may answer . . . by wondering thinking, and imagining." Wow! Is there anything more exciting to a kid?! 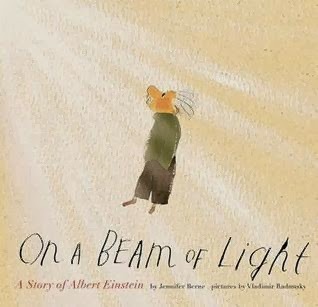 What an empowering book: someday you can carry on where Albert Einstein left off. You can discover amazing things, too. This is not a new book. 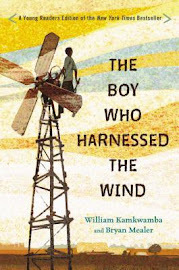 In fact, it won the Caldecott Medal fifteen years ago in 1999. But the boys and I read it for the first time last winter, and I think it's fast on its way to becoming a traditional winter read for us. 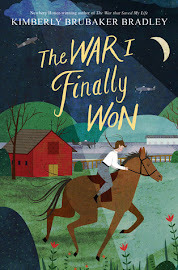 It's about Wilson (Willie) Bentley, a farm boy who grew up in Vermont during the second half of the nineteenth century. He loved snow and said it was "as beautiful as butterflies or apple blossoms." He wanted a way to capture and remember all of the magnificent designs and patterns of individual snowflakes. He realized that no two snowflakes were exactly the same. At first he tried drawing the designs, but he never could finish them before they melted away. Then he heard about an expensive camera with a built-in microscope. His parents were anything but wealthy, but they knew how much Willie loved the snow, and so they spent their savings to buy him the camera. Even with the camera, it took Willie a lot of time and patience to get successful photographs. He became known as "the Snowflake Man," and eventually his best photographs were published into a book. This book is perfect for young kids because it's told in a simple, conversational style, but then it also has additional facts along the sidebars. The first time I read it with my kids, we just read the main body of text, but we have since branched out in our desire to learn more. The illustrations (woodcut and watercolor) perfectly match the style of the text. I love Willie Bentley's story because it demonstrates how even our hobbies and interests are valuable and have meaning. Willie never became rich as "the Snowflake Man." In fact, it says that he spent "$15,000 on his work and received [just] $4,000 from the sale of photographs and slides." But his work was still important and people still refer to his book Snow Crystals today. (When I went to Aaron's school for his SEP conference a few weeks ago, his teacher actually had a copy of Snow Crystals sitting on the piano. It was fascinating to look through it and see the huge variety of snowflake patterns.) I think it's exciting for kids to realize that the things they do for fun now (drawing or riding their bike or cooking) can continue to be the things they do for fun later. They might not turn those interests into a career, but they can always get enjoyment and pleasure out of them. Do you have a favorite picture book biography? Do tell! I'm always on the lookout for more! Oooooooooo the Einstein one looks good to me. 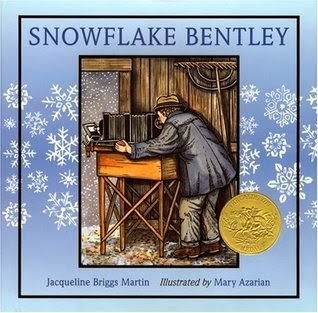 "Snowflake Bentley" is a favorite of ours, too! Another good one is "Uncommon Traveler: Mary Kingsley in Africa," by Don Brown. We loved getting to know spunky Mary, and Brown includes many quotes from her journals in the text. I know Brown has done several others. I have yet to get my hands on them, but I want to! I haven't heard of that one! I can't wait to try it out! Thanks for the recommendation. I just looked up Don Brown's other books and realized he wrote one of our favorites: Henry and the Cannons. He looks like he has some other great books, too. A picture book biography we've enjoyed is "Who Says Women Can't Be Doctors? The Story of Elizabeth Blackwell." That one sounds great! I will have to see if our library has it. Love the second two and now must check out the first!